Last saturday I was helping two lovely ladies revamp their wardrobe. After I was done shopping for them I decided I’d do a little shopping myself, and on my way out of beacons I came across 2 amazing items I just couldn’t leave behind. 1 was an amazing vintage coat with a fur trim around the neck, arms, and skirt. I have been looking for a coat like this since my Barbie playing days. I remember having a Christmas Barbie that had a coat just like this in white and I remember loving it so much. I carried that love for this type of coat throughout my years and finally at the age of 24 I found it! 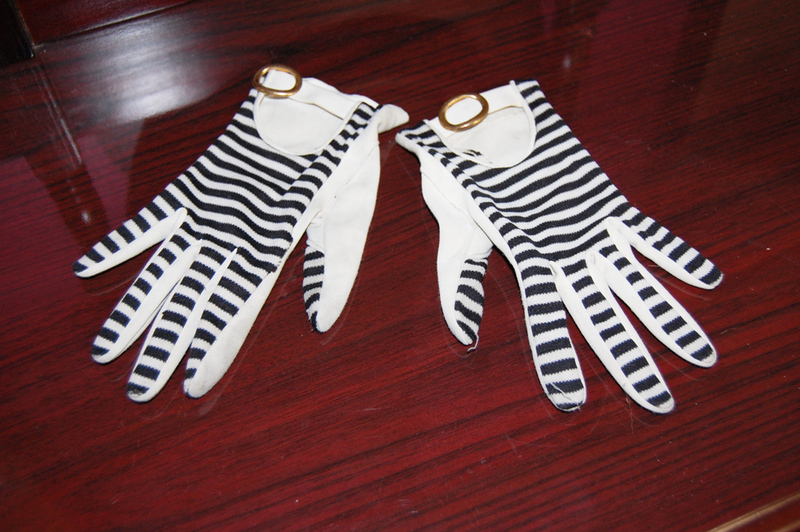 Another item I found were really cute vintage striped gloves with an edgy gold buckle at the top. I LOVE stripes and I love the fact that they were black and white with the gold accent of the buckle. They need to be cleaned and there’s a little hole in one of the fingers, but its nothing major that I can’t fix. I cannot wait to wear them. I wasnt supposed to go shopping so that was all I bought (I am on a shopping diet), but two powerful pieces was all I needed to be happy! I told myself I wouldn’t buy any more fur but this was an exception. This coat is so warm. I cant wait to wear this coat with my vintage dresses! I LOVE LOVE LOVE LOVE these gloves. I am thinking a striking black/white tight-fitting dress, a red lip, black pumps, and some black cat eye glasses. Meow. ← Basta Surf event at the Tribeca Grand! That coat is a amazing! I just found a real fur coat at Salvation Army for $6. It smelled sooooo bad, Jasmin. I wanted to NOT get it. Luckily I toughed it out and took it to the dry cleaners. It’s good as new! First, you have a great blog. When I first saw it, I thought wow great, you know so much about the profile is written 50 styling. I was so surprised because I do not know too many people so much knowledge of 50 years (for example, the clothing). I’m rarely a fan of pin up girls from or what to do with the styling of the clothes. Really great with that jacket so much styling. GREAT blog. I have got myself a blog. Am I myself tepromoten, sorry but I’m really a big fan now! I love the coat!! xoxo! I am in love with that coat!!!! O_O that coat makes me droooll, ay que linda! If I were thinner, I would steal that coat from you. Love it! That coat is bad bad bad… Ur one lucky girl!